We offer a full range of automotive detailing packages and individual appearance services for your personal or company vehicle. Whether you want a complete detail with hand wax and clear coat polish, or a simple quick wash, we provide the expert service you want to make your car look new. 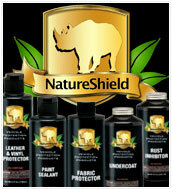 NatureShield vehicle protection products are eco-friendly, long lasting, professional grade, and highly effective. Our expert technicians will apply Paint Sealant, Leather and Vinyl Protector, Fabric Protector, and/or Undercoat to protect your new car look for years to come. 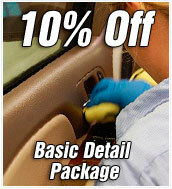 Professional repair and recoloring of interior leather, vinyl, fabric, and plastics. We repair cigarette burns, tears, cuts, holes, punctures, scratches, gouges, stains, and fading. Remove pet odors, smoke odors, food odors. Kill germs, bacteria, mold, and mildew. Eliminate these and other contaminants from your vehicle's interior. We professionally apply DrivePur Automotive Protection Services to sanitize your vehicle's interior. Keep your family safe and healthy. Auto detailing, interior restoration, interior sanitization, and auto appearance protection product application. We do expert automotive interior restoration services, quick wash, basic, standard and deluxe auto detailing packages, and we offer commercial make ready and fleet services. We are a professional provider of NatureShield products/services, including, Paint Sealant, Leather and Vinyl Protector, Fabric Protector, and Undercoat. For individual consumers we provide the exacting level of detail that professional auto dealers require. Your car looks better than it has since the day it rolled off the showroom floor. Check out what Nate says.